Guadeloupe is located in the French West Indies. Easily identifiable thanks to its unique butterfly shape, with Basse-Terre on one side and Grande-Terre on the other, Guadeloupe is an ideal holiday destination for lovers of the sun. Temperatures rarely go below 25° C (77° F) allowing you to enjoy the outdoors throughout your stay. Luxury villa with an infinity pool, apartment with access to a beach, charming bungalow with a jacuzzi, villa with a sea view, there's definitely a rental for you in Guadeloupe! We have found the place now it's up to you to create the memories. Where to stay in Guadeloupe? Guadeloupe covers more than 1600 sq.m.As a result of so much to do, we recommend a two-week stay to fully take advantage of the riches the island has to offer, especially if you wish to spend a few days on the other islands of the archipelago (Les Saintes, La Désirade, Marie-Galante, etc.). Be sure to book in advance! If you want to have a wide choice of accommodations and the best prices available, do your research in advance! This advice especially applies if you're traveling in the peak season or in a group. Villas able to accommodate large groups are sometimes booked one year in advance. To help you choose a holiday rental in Guadeloupe, VillaVEO, a specialist in personalized holiday rental experiences, offers you a wide range of accommodations to choose from: scroll down to discover the villas and apartments in Guadeloupe meeting our quality standards. How to choose between Grande-Terre and Basse-Terre? The solution would be not to choose and to discover both parts of the island! However, if you're planning to stay for only one week, we suggest that you choose either Grande-Terre or Basse-Terre, unless you don't mind spending a lot of time driving! You can also stay in the town of Gosier whose more central location makes it possible to fan out more easily over the island of Guadeloupe. Grande-Terre is the part of the island with the most resorts. The towns of Sainte-Anne and Saint-François are known for their lively atmosphere. Many restaurants and bars border magnificent white sand beaches. Sports lovers will enjoy the wide range of activities available. Designed by Robert Trent Jones, the international Saint-François golf course features 18 holes. Water sports enthusiasts will have have many things to discover. The Gros Sable Beach in Sainte-Anne is renowned for surfing and the Bois Jolan Beach between Sainte-Anne and Saint-François for kitesurfing. One of Guadeloupe's most visited sights is also in Saint-François, namely Pointe des Châteaux. Basse-Terre is mountainous and the tropical forest is much more present. A large portion of Basse-Terre is home to the Natural Park of Guadeloupe. This part of Guadeloupe is geared more towards nature lovers. Waterfalls (Chutes du Carbet , cascade Paradis, cascade aux écrevisses), hot springs (bassin paradise, bain des amours) hiking (La Soufrière is a must-see)—your days will be filled with exploring! The island boasts many exceptional spots including the Réserve Cousteau in Bouillante where tropical fish and sea turtles quietly go about their business. Guadeloupe also has hundreds of underwater wrecks to explore! Lastly, rum lovers will also be busy, as Guadeloupe has a number of distilleries including Montebello, Damoiseau and Bologne. Why choose to visit both of Guadeloupe's main islands? It would be incorrect to speak of one Guadeloupe. The destination of Guadeloupe is in fact a group of islands. This archipelago comprises the main islands of Guadeloupe (Basse-Terre and Grande-Terre), plus Marie-Galante, La Désirade andLes Saintes. Each island has its own personality. The Bay of Saintes is one of the most beautiful in the world and you'll enjoy discovering Terre de bas on foot or Terre de haut by scooter (Les Saintes is composed of 7 small islands with two of the islands inhabited). Marie-Galante, the "big pancake", is famous for the beauty of its beaches and its rum. The land of this island of 100 windmills is mainly covered in sugar cane. Lastly, Désirade off the coast of Grande-Terre is like taking a step back in time. Express des îles provides ferry service to Basse-Terre, Grande-Terre, Les Saintes and Marie-Galante. To reach Désirade, several companies provided round-trip service from Saint-François, including Babou One, La Somade - le Colibri, Comatrile and Archipel 1. Please don't hesitate to share your travel ideas with our pathfinder who will assist you in putting together the perfect package! What are Guadeloupe's most beautiful beaches? It's so hard to choose, there are so many beautiful beaches in Guadeloupe! Here are a few suggestions! In Grande-Terre, we recommend Caravelle Beach. It is located near Club-Med in Sainte-Anne. There are two advantages—being able to rent beach chairs and having a drink at the bar! Families will enjoy Bois Jolan Beach because the water is very calm. Raisins Clairs Beach in Saint-François also provides a pleasant setting for families. Special mention goes to Anse de la Perle Beach between Sainte-Rose and Pointe-Noire. Snorkeling enthusiasts can explore to their heart's content! Grande Anse Beach in Deshaies is also very well-known. Lined with palm trees, it's the ideal spot for a picnic in the shade with family or friends. It should be noted that you can take in beautiful sunsets on the beaches of Deshaies! 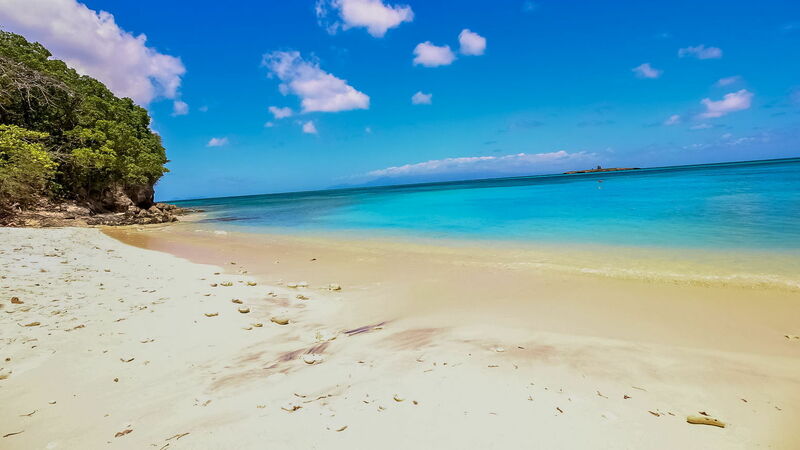 For more information on the beaches of Guadeloupe, you can take a look at our top 10 most beautiful beaches in Guadeloupe! Whether you prefer Basse-Terre, lush and ribboned with hiking paths, or Grande-Terre and its seaside resorts or Marie-Galante and its fine sandy beaches, you'll most definitely find your dream rental for an exceptional holiday in Guadeloupe. Do you need any additional information? Contact us! 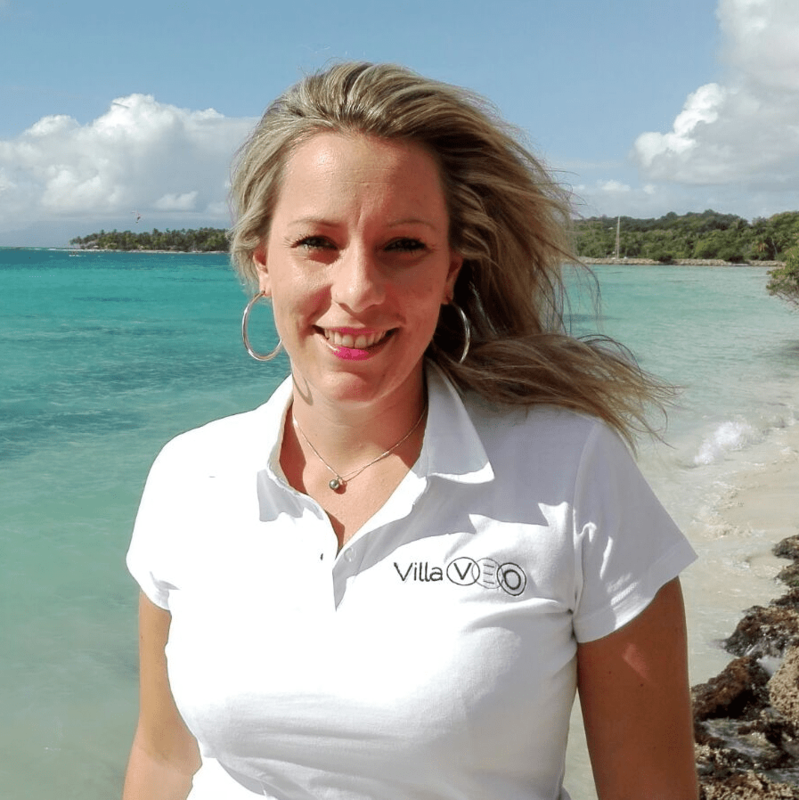 Coralie, our pathfinder in Guadeloupe will be happy to answer your questions!